Custom apparel is used in numerous industries for various applications including uniforms for baseball teams, retail apparel for restaurant promotion, giveaways for product launches and this barely scratches the surface. The fabric or garment type selected to embellish as custom apparel often depends on the function of the apparel piece. Fleece is a type of wool, generally the wool shorn off a sheep or like animal. A soft fabric featuring a "silky pile," fleece is used as garment liner and in stand-alone form. The fabric is commonly used in the creation of hoodies and similar "sweat" clothing, and is a popular option for custom apparel. Hoodies make a great choice as office gifts, sports team gear or for promoting a business or establishment, as people love to wear them! Screen print and embroidery are also great applications for fleece customization. It’s important to note, however, that deep pile fleece is not good for screen print. Stick with embroidery on that one. 100% Cotton is natural, breaths well but does not dry quickly. It resists pilling and tends to wrinkle and/or shrink. Common fabric types for custom apparel certainly includes cotton, a versatile fabric used in the creation of t-shirts and other garments. Just about everyone enjoys the classic, 100% cotton tee, and such shirts offer several printing options, including screen printing and direct-to-garment printing (Note: DTG requires 100% cotton.). Polyester is a popular t-shirt choice as it is synthetic & durable, wrinkle & stain resistant, and holds its shape and color well. Today's polyester designs often feature moisture-wicking properties, making polyester an ideal choice for a team softball or bowling league. Cotton/polyester blends are another option as they feature the breathability of cotton but don't wrinkle or shrink as much as pure cotton garments. 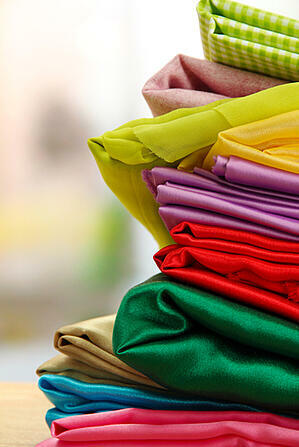 Its important to note that polyester and its blends cannot be printed using direct-to-garment technology. Polyester also has a tendency to dye-migrate (fabric dye contaminates printed ink color); so if screen printing, consider dark ink printing on a lighter garment. Often featured in outwear designs, nylon is frequently utilized in the designing of parkas. For example, a parka consists of a nylon "shell," filler and polyester lining. Resistant to the elements, nylon is an optimal fabric to use when designing custom outerwear. Also, when screen printing on nylon, a special formula is mixed specifically for the water resistant properties inherent to nylon fabrics. Leather is an animal "fabric" as it is made from the skin of cows, goats and other creatures. Suede is a version of leather, or leather than has had the "flesh side" turned outward and brushed to create a velvety, soft-to-the-touch surface. One of the more expensive fabric types, leather is often used in the creation of "Letterman" and company jackets. If considering embroidery, avoid using leather, as it tends to be thick and is not a good choice for embroidery. Choosing the right fabric for custom apparel requires careful consideration based on budget, design ideas and the size of the order. Do a little research and select the best fabric for the company or establishment involved!